Having listened to the final Really Like This Book podcast that I had on my phone, and seeing as crime fiction, historical fiction and stuff set in other places generally are all genres I enjoy, I have decided to read Lindsey Davis’ Falco novels from the start – and The Silver Pigs is the first. 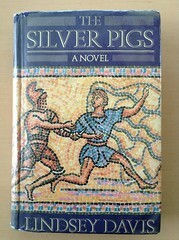 Getting hold of The Silver Pigs in itself comprised a mini-quest – requiring a request to retrieve it from Barbican Library stores. As an aside, I appreciate that shelf space is limited, but it is so frustrating that they can’t keep entire series available on the shelves. The same thing afflicts Robin Hobbs’ Farseer novels. But, at least the request/retrieval system is free and efficient. But back to Imperial Rome. I didn’t warm to Marcus Didius Falco to begin with but trust in Kate Macdonald glowing recommendation got me over that hump and now I am hooked. What didn’t I like ? The cocky attitude and the socially superior male gaze. And then I realised it was a mechanism to show Falco’s failings – the swagger hiding the insecurities and loneliness of a single man in his early 30s. Straight on to Shadows In Bronze!